The battle is on to succeed the graduated Greenwich great Emily Philippides as the 1000m champ. Old Saybrook junior Grace Hanratty knocked more than 5 1/2 seconds off her PR when she won the S championship in 2:58.03, and she goes to the CIAC meet as a slight favorite. Also in the top 5 seeds to knock Hanratty off her stride will be LL winner Grace Adolphe (Wilbur Cross) 3:01.92, M champ Sydney Schultz (Ellington) 3:02.83, S runner-up Cassandra Carleson (Plainfield) 3:02.99, and M runner-up Elizabeth Stockman (Rocky Hill) 3:03.95. And that brings us to the "dark horse" candidates in a competitive field, who include 6th seed and LL champ Kate Hedlund of Manchester who won her Class race by more than 5.5 seconds and scored the second best CT time this year of 2:58.92 with a 4th at Yale. 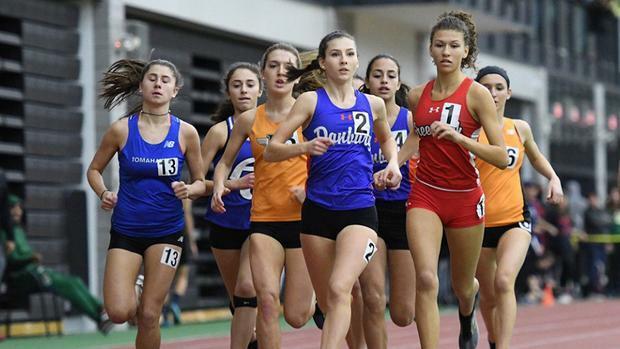 Assuming the the 1000m is divided into two sections, a couple of dangerous runners from the first less-fast group might include Glastonbury's Grace Sparrow who ran a 3:00.05 for 5th at Yale and Danbury's Cassandra Sturdevant, the 2018 CIAC runner-up and 6th place finisher at Yale at 3:03.41. Last year's winner Lauren Moore of Danbury is again seeded #1 after a comfortable 5:12.18 win in Class LL. Close behind are a pack of runners including M winner Kathryn Rodrigues (Wolcott) 5:12.75, S champ Taylor Mascetta (Immaculate) 5:13.07, and New Milford freshman and L winner Claire Daniels at 5:13.28, who leads a trio of top frosh runners that include Mairead Clas (Darien) 5:14.36 and Stephanie Queiroz of Danbury at 5:15.54. Juniors Zoe Harris (Greenwich) at 5:15.49 and Tess Pisanelli (Ridgefield) at 5:16.05 should also be contending up top. Last year's winner Elizabeth Stockman is competing in the 1000m this year, but the rest of the top 5 from the last February's 3200m are back. Top seed and LL winner Mari Noble of Greenwich has a seed time of 11:06.55, and her Yale 3000m time converts to a 10:55.34. 2nd seeded S champ Emily Sienna is at 11:09.85, LL runner-up Daniella Grullon-Pena of Danbury is next at 11:19.60 with a 11:12.84 conversion from Yale, and her teammate Lauren Moore is 4th seed at 11:19.77. Other runners whose Yale conversions put them in contention include Wolcott's M winner Kathryn Rodrigues (11:02.57 c), S runner-up Kylie Raymond of Somers (11:04.11 c), and Guilford's L winner Meredith Bloss (11:18.77 c).